When is a Parker 45 not a Parker 45? - When it's a Parker New Slimfold! The Parker "New Slimfold" or Slimfold MK II was produced from Parker Newhaven and was sold from late 1971 until 1975 when the pen was discontinued ending the Slimfold line of pens. The pen shared a lot of similarities and parts from the more well known Parker 45, including the nib, feed and collar as well as the clip. However it was cheaper to produce and had less parts as Parker gave the New Slimfold a screw on cap meaning that the internal cap spring was no longer needed to keep the cap in place and instead of a clutch ring between shell and section the New Slimfold simply had a slim chrome ring at the base of the cap. Due to the fact that is uses the Parker 45 nib assembly and it's similar over all appearance it is frequently mistaken for the more well known Parker 45 although unlike the 45 the New Slimfold never really caught the public's eye and sales were poor even though, with the same internals as the 45, it is a competent little pen. To this day the New Slimfold does not cause much of a stir with collectors and is more often then not mis-labeled as a Parker 45 Screw Cap. This also means that they can be picked up very cheaply and often make a bargain vintage pen to use as a daily writer or as a base for a budding collector to start upon. Look out for New Old Stock versions with the Parker New Slimfold chalk marks on the barrel still intact. Colours that we have seen include black, blue, green and dark red in Chrome Trim and later in Gold Trim. 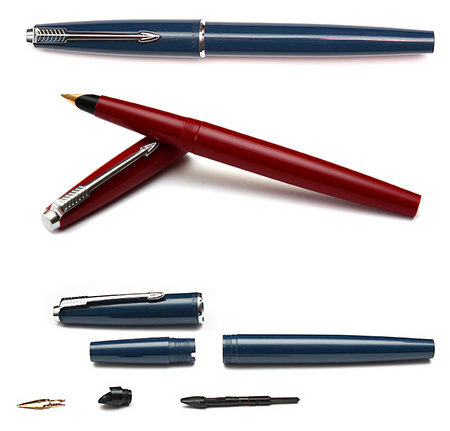 Both share the same nib, collar and feed, both use the same arrow clip and individually both look much the same. The Parker 45 is slightly more tapered and narrower at the end of the barrel. Put the pens together and the differences are more apparent. The most obvious difference is that the New Slimfold has a screw on cap where as the Parker 45 has a push on cap. The New Slimfold is also slightly shorter at 128mm compared to the Parker 45's 136mm with their caps on. 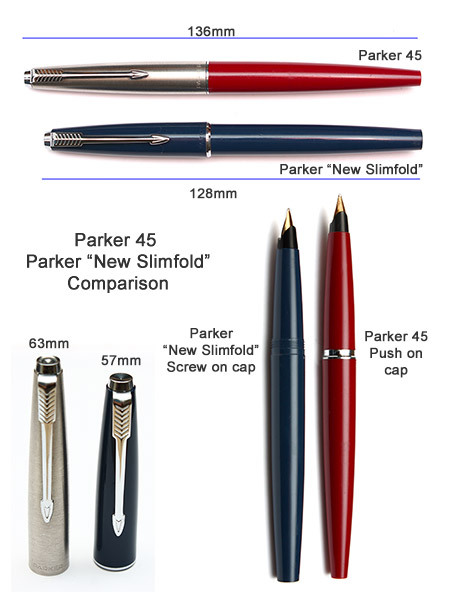 The Parker New Slimfold Cap measures in at 57mm where as the Parker 45 measures a slightly larger 63mm. Body lengths without the caps are Parker New Slimfold 117mm and 127mm for the Parker 45. In Feb 1971 Britain changed over to a new decimalised currency and the country was given an 18 month period of time in which to get used to the new system and phase out the old. During this time the price of goods was often displayed in both systems as in the chalk marks on this New Slimfold which shows a price of one pound and 10 shillings or £1.50 in the new decimal currency, dating this pen as one of the first of the New Slimfolds in late 1971 to early 1972.